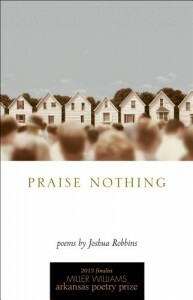 Joshua Robbins is the author of Praise Nothing (University of Arkansas Press, 2013), a finalist for Miller Williams Poetry Prize. He teaches creative writing and literature at the University of Tennessee, and lives in Knoxville with his wife and son. His poetry has been selected for the Best New Poets 2009 anthology, and has appeared in Anti-, Linebreak, Still, and Verse Daily, and the anthology Apocalypse Now: Poems and Prose from the End of Days. I try to write something every day, at least six lines per day, usually comprised of images and bits of language that I record in a pocket-sized notebook I carry with me. The progress on individual poems comes gradually. Sometimes my poems are assembled collage-style from my daily writings and notes. Sometimes they come from little assignments I give myself. For example: “Write a poem that uses the following words: sunrise, cargo, tunnel, spirit, knife, geography, pattern, reason, smoke, and water.” As I write, I find that the assignments will often trigger something in me and I’ll have an entirely new direction to go, hopefully toward a draft. Once I’ve got a draft, the process is one of counting: making pass after pass over the draft, tinkering with the accentuals and measure, culling superfluous lines, altering syntax, improvising and moving the puzzle pieces around until I finally recognize the picture. 3. Can you say a little bit about the genesis of your book? The manuscript began with an assignment from Paul Zimmer to write a theme-based chapbook. At the time, I’d been thinking about the assumption that the religious can only be autocratic in its relationship to art and, therefore, very difficult to incorporate into contemporary poetics. When Zimmer gave us the assignment, I was reminded of the hymns I sang in the sanctuary after Sunday School: Be Thou My Vision and A Mighty Fortress Is Our God and Abide With Me and The Sweet By and By. What I found was that the hymns of the Christian tradition possessed a unique power for me, one which creates a space where poetry and religious faith (or lack of faith) can coexist despite so much pop-cultural and po-biz pooh-poohing. I ended up writing a dozen poems responding to those hymns I sang growing up. Not all of the poems made it into the final version of Praise Nothing, but that project set me on the path toward a full-length manuscript. I would never use the word “sacrifice,” but I have, I suppose, risked some things. One story I like to tell is how I was forced, or so I thought at the time, to read an excerpt of Paradise Lost in high school English class. It was soon after reading Milton where I discovered the power of poetry: Milton’s language had made me, a Southern Baptist’s son, feel sympathetic to Satan! If that’s what poetry could do, I wanted that power, I wanted to be a part of poetry. Soon after, I was cluelessly browsing the local bookstore’s poetry section and waiting for a title to speak to me as Milton had. And then I saw it: Satan Says by Sharon Olds. I was a broke teenager, but had to have it, so I put the book in my pants and squirmed my way out of the store. I never looked back. I’ve found that writing poetry is a process of discovery. Always. If I’m not learning something about myself, about my relationships to others, if I’m not finding new ways to explore the world and make it new through language, if I’m not made uncomfortable and challenged by my own material, then I don’t know what it is I’m doing exactly, but it’s not writing poems. This was written by joannemerriam. Posted on Saturday, April 20, 2013, at 8:31 am. Filed under Poetry, Um... yeah. Tagged Intermittent Visitors, Joshua Robbins. Bookmark the permalink. Follow comments here with the RSS feed. Both comments and trackbacks are currently closed.